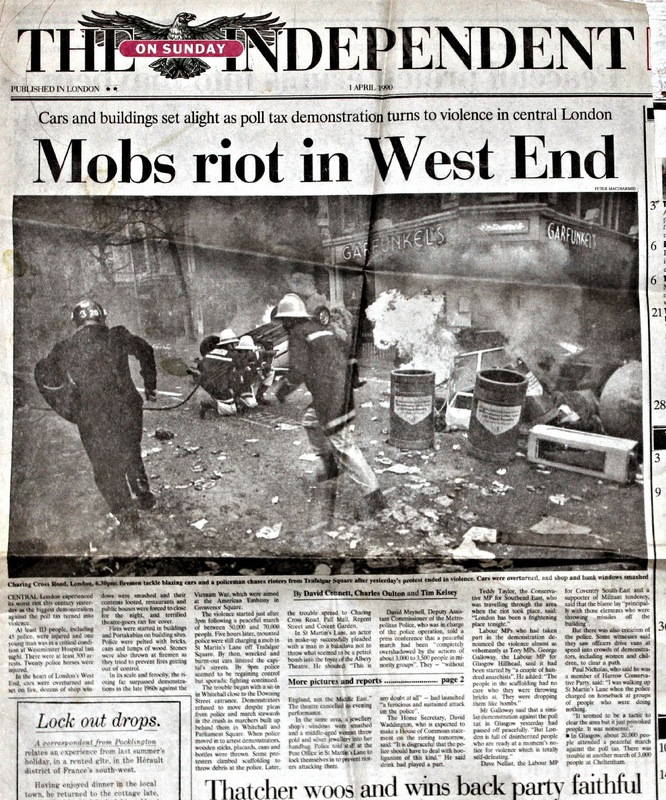 The big London Poll Tax riot was 25 years ago today -31 March 1990. Here's a few contemporary newspaper reports (click to enlarge). 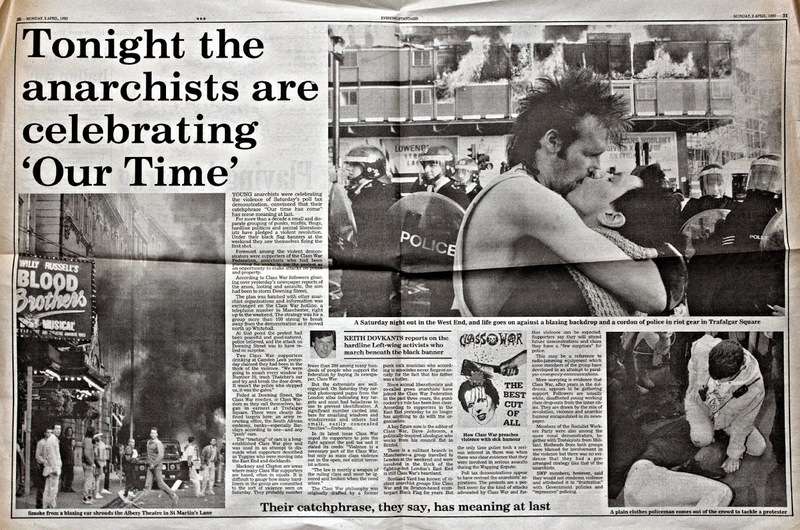 One of a number of press reports seeking to blame the riots on 'Left wing activists who march beneath the black banner... For more than a decade a small and disparate grouping of punks, misfits, thugs, hardline politicos and animal liberationists have pledged a violent revolution. Under their black flag banners at the weekend they saw themselves firing the first shot'. 'Class War and its Brixton-based counterpart Black Flag' are mentioned the formed linked to squats in 'Hackney and Clapton' ('London's East End is still Class War's heartland'). Much of this is pure invention, such as the claim that rioters on the day carried 'small, easily concealed "mollies" - firebombs'. I don't recall any petrol bombs being thrown on this day. Another ludicrous piece of misinformation - 'Agitators toured pubs offering £20 to anyone willing to join their army of envy'. Considering hundreds of thousands of people had made the effort to travel from all over the country to be there, it was hardly necessary to pay anybody else to join in! The report itself says that 60 coaches came from Bristol, 40 from South Wales, 30 from Weymouth etc. The angle of this piece is that decent theatre goers were terrorised by the 'howling mob' - no doubt some were frightened by the scenes, but the riot did not include attacks on random members of the public. Tourists wandered around in the middle of it. Again there is the myth here of the 'fire bombers' - it is true that a small number of cars were set on fire, but not I believe with petrol bombs. 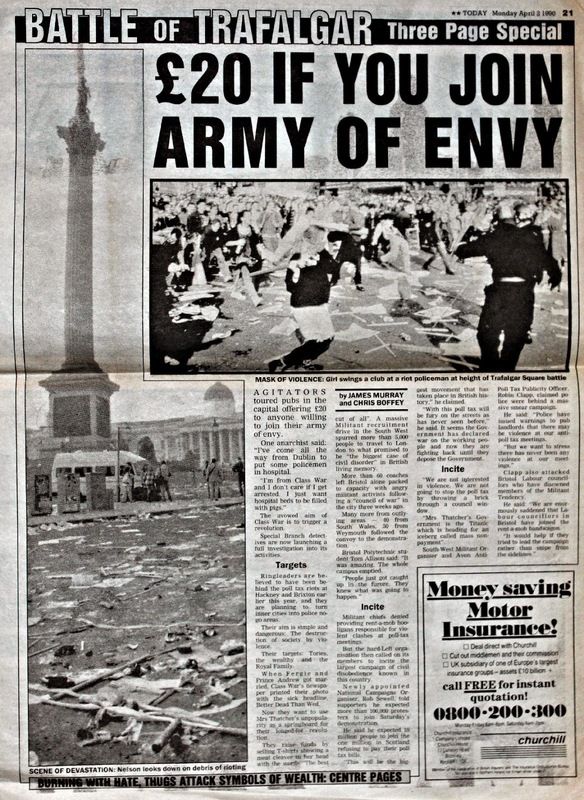 Still the looting and rage against 'symbols of wealth' was real enough: 'the riot against the poll tax turned into open warfare against the wealthy and all the symbols of affluence... Garrards, the royal jewellers, was a favourite target. Thugs wearing punk clothes uprooted bins and hurled them against the windows. West End fashion shops were next in line. Some grabbed £400 suits from gents clothes shops while women dressed in rags robbed other stores'. The story does include the fantastic line 'The great English public is rioting, sir' reported as being said by a policeman in reply to an American tourist asking what was going on. Note to clarify (3 April 2015): in the image above I have blurred out the faces, they are clearly shown in he original and indeed I believe that they were all subsequently arrested. The guy with the white t-shirt was jailed and the guy leaning in to the porsche was acquitted in a trial that made headlines because the judge dismissed police evidence as lies (I believe a policeman claimed to have witnessed it but couldn't have done because of his location). I decided to blur the faces because they are still recognisable from these photos today and for work or other reasons might not want people to know about what they may or may not have been up to in 1990.